You should always ask your PSP (Print Service Provider) to provide you with a proof before the final graphics are produced. Allow anywhere from 24 to 48 hours in most cases for your proof to be ready. Then allow sufficient time to review the proof with your boss, client or whomever. The PSP’s production clock stops at this point until you approve the proof – which means the longer you take to approve it, the longer your due date becomes. 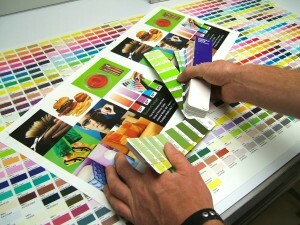 Prior to the proofing process give the printer any Pantone Matching Colors, products or art work that is critical for color-match. If possible always build in enough time for a second round of proofing just in case you are not satisfied with the results of the first proof, usually another 24 hours. Once the approval is ok’d the printing process will begin.